I’m a Brussels sprouts freak. I’d even go as far as saying that they are my favorite food. But, I understand why most people don’t share my love for these miniature cabbages: Brussels sprouts can taste like crap unless you prep them correctly. Here are some tips on how to make Brussels sprouts which actually taste good. 1. Don’t Eat Frozen Ones! One summer, I was craving Brussels sprouts. Since Brussels sprouts are seasonally available in the cooler months, I settled on buying a bag of them frozen. I proceeded to cook them like I normally would. Ravenously, I lifted one into my mouth. Frozen Brussels sprouts become all soggy when you cook them. They lose all their savory taste and only the bitterness remains. I’ve never tried canned Brussels sprouts but I imagine that they are 100x worse than the icky frozen ones! Since many people are introduced to Brussels sprouts as the frozen or canned variety, it is no wonder that they hate them. First off, they MUST be fresh! When picking Brussels sprouts, look for small ones (not as much bitterness). They should have a nice bright green color and their little leaves should be compact together. Avoid any sprouts which are pale or yellowing. Cut off the hard remnants of their stem. This will allow them to cook faster and more evenly. Cut them in half. If you have really big Brussels sprouts, then cut them in quarters. 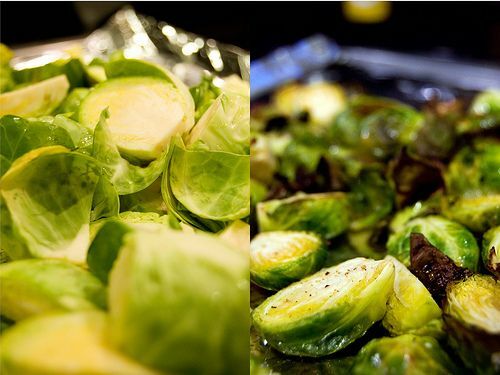 2) Steam the Brussels sprouts until they are bright green. Steaming will get the bitter flavor out of the Brussels sprouts so you are left with only tasty green goodness. You will know they are ready when you can slide a fork into them without applying too much pressure. They should NOT be mushy though! Alternatively, you can boil the sprouts but steaming preserves more of the nutrients in them. Tip: Add some lemon juice to the water when steaming to add a fresher flavor! I like to sauté my Brussels sprouts in butter with lots of garlic. Just heat a bit of veggie butter and add the chopped garlic and sprouts at the same time. Add salt to your liking. I let mine sauté until they are browned on the cut side. Roasting them usually takes about 30-40 minutes at 350 degrees F.
To get a nice dose of B12, top your sprouts with nutritional yeast. Or, for a really nice wintertime treat, toss in some roasted chestnuts with the Brussels sprouts!